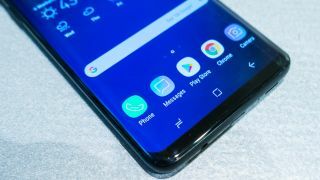 We may have just had our first look at the Samsung Galaxy S10, or at least a prototype of it, and if so then next year’s phone could be very different to the Samsung Galaxy S9. In a photo shared by known leaker @UniverseIce, the apparent prototype has an all-screen design, and when we say ‘all’, we mean it, as there’s no top bezel and virtually no bottom bezel either, with the phone seemingly sporting an even higher screen-to-body ratio than the 93.8% offered by the newly announced Oppo Find X. You can see also that the phone shown here seems to still have a curved screen and likely a Bixby button, along with its power and volume keys. It's worth noting that the name 'Samsung Galaxy S10' isn't used in the leak, but the word 'Beyond' is, which is believed to be the Galaxy S10's codename, and coupled with the curved screen and seemingly a Bixby button that's likely what we're supposed to be looking at. But whatever the phone it’s that screen that’s of most interest, and which raises the most questions, since to achieve this design Samsung presumably must either be using pop-up cameras (at least for the front-facing snapper) or have the camera built into the screen. The fingerprint scanner – if there is one – could be on the back, though Samsung’s been rumored to be working on an in-screen scanner too, so that’s a distinct possibility. And we’ve also previously heard talk that Samsung could build the speakers and earpiece into the screen, all of which suggests it’s moving towards an all-screen design. And it’s a design that makes sense. Samsung has been iterating on roughly the same design for several years now, and, curves aside, it’s starting to look slightly dated in the face of phones with almost no bezels, so it makes sense for Samsung to want to change the design and catch up, especially as this is the tenth generation of the S range, so it’s an important year for the phone. Of course, as always you should take this latest leak with a pinch of salt. The image could very easily be a fake or showing some other phone, and even if it’s accurate we’re a long way from launch, so changes may well be made to the design. Still, if it is genuine it suggests the S10 may be a very different, and much more exciting, phone than the S9.